Agriculture plays a central role in the economies of nations throughout Africa, accounting for between 30 and 60 percent of all economic production. In many African nations, a majority of the people is engaged in farming, producing goods for domestic use and sometimes for export as well. Peasant and subsistence farming is the basic form of agriculture in most parts of the continent. Agricultural practices in Africa are extremely varied. Many of the differences are related to the continent’s environmental diversity—its great range of landscapes and climates. Crops and farming methods suitable for the dry, desert regions of North Africa are quite different from those appropriate for the tropical rain forests of central Africa. In addition, the cultural tradition of a group or a region influences what crops are grown and the techniques used to grow them. There are two main types of farming in Africa: garden crops, grown primarily from the roots or shoots of plants that have been placed in the ground, and field crops, grown mainly from seeds. Africans also raise various animals as livestock. One of the oldest and most important root crops in Africa is the yam, a starchy plant sometimes mistakenly referred to as the sweet potato. Grown primarily in tropical or subtropical regions, yams are a reliable staple crop that can be stored easily for later use. Although rather low in nutritional value, they are often grown in combination with vegetables and other foods that help provide an adequate balance of nutrients. In some parts of Africa—especially western, central, and eastern Africa—cassava is an important food crop. This starchy root plant is the source of tapioca. Although once regarded as only an emergency crop for use during periods of famine, cassava is now planted extensively and has even replaced the cultivation of yams in some areas. Suitable for growing in a wide range of climates, cassava can be left in the ground in both wet and dry seasons much longer than most other crops. Two other important African root crops are potatoes and plantains. Found mainly in the drier, Mediterranean-type climates of North Africa and southern Africa, potatoes are also grown in the higher elevations of other regions. Plantains, a relative of bananas, have been an important crop in Africa’s tropical rain forests for centuries. Used mostly for cooking, some varieties of plantains are also brewed to produce beverages. Another plant of the banana family, the enset, is sometimes called the false banana. The enset does not produce an edible bunch of fruit like its cousin, the banana. Instead, its stems are used to make fibers and ropes, while its seeds are used for ornamental and medicinal purposes. Found wild in several areas, the enset is cultivated only in the highland regions of ETHIOPIA, where its starchy stem is pounded, cooked, and served as a staple food. A variety of root crops have been introduced into Africa from other parts of the world. Taro, a plant that grows near rivers and streams, came from Southeast Asia. Groundnuts, which are valued for their oil, and various types of beans have traveled to Africa from the Americas. Seed crops of grains and cereals are grown from seeds saved from the previous harvest. Raised in cultivated fields, these crops are found throughout Africa, particularly in the savannas and regions of medium rainfall. The most widespread of African grains—and the most important food in the history of the continent—is sorghum. Originally developed from wild grasses native to the savanna regions of northern Africa, sorghum has been grown for food for at least 7,000 years. In some areas, the cultivation of this grain probably developed in close association with LIVESTOCK GRAZING. The spread of sorghum, however, is linked to the development of iron industries about 2,000 years ago. Iron tools proved especially useful for breaking and clearing the hard, dry soils of the savanna regions, as well as for weeding and harvesting crops. Another important grain crop of the savanna regions of Africa is millet. Certain species of millet—including one called “hungry rice”—are especially important during times of famine because they can survive fairly long periods of little rainfall. In some areas of Africa, the traditional cultivation of sorghum and millet has been replaced by the growing of maize, or corn. Brought from Central America, maize was grown in very limited amounts at first and only in a few coastal areas of West Africa. During the 1900s, however, the cultivation of maize spread and it became important as a staple food crop, especially in eastern and southern Africa. Maize is also grown extensively in parts of North Africa, primarily in areas under irrigation. Farmers who practice intensive cultivation of maize often use mechanical plows and artificial fertilizers. Two other grain crops, wheat and barley, are raised on a limited scale. Once restricted to the lower Nile Valley and the highland regions of Ethiopia, wheat and barley have been introduced to highland areas of southern and eastern Africa. Irrigation and the development of new plant strains have also allowed wheat cultivation to spread to some savanna regions. Wheat and barley are grown primarily to make flour. Two main species of rice are grown in Africa. Common rice originated in Southeast Asia and probably reached eastern Africa more than 1,000 years ago by Indian Ocean shipping routes. The other species, Guinea rice, is native to wet areas of the Guinea coast and upper Niger River region of West Africa. Rice does not require grinding and can be stored and transported quite easily. In towns along the eastern coast of Africa, rice gained prestige as a food for travelers and guests. Among the most important rice-producing countries in Africa today are Egypt, GUINEA, SENEGAL, SIERRA LEONE, IVORY COAST, NIGERIA, and TANZANIA. In addition to the main root and seed crops, Africans grow various legumes, fruits and vegetables, and plants used to make beverages. Protein-rich legumes—such as beans, cowpeas, and soybeans—are produced widely throughout Africa, generally in combination with other crops. Such crops are typically grown in garden plots tended by families. Among the most important fruits raised in Africa are dates, figs, olives, bananas, and pineapples. Dates, figs, and olives are cultivated primarily in the desert oases of North Africa. Bananas are grown throughout the tropical regions of Africa; pineapples are produced mainly as a cash crop in SOUTH AFRICA, Ivory Coast, the Congo basin, and KENYA. Citrus fruits, including oranges and grapefruit, are grown for export primarily along the southern coast of South Africa and the Mediterranean coast of North Africa. A number of vegetables—including tomatoes, onions, cabbages, peppers, okra, eggplants, and cucumbers—are raised in Africa. Tomatoes and onions, the most common vegetables, grow in large quantities along the coast of North Africa. The principal beverage crops of Africa are tea, coffee, cocoa, and grapes. The largest producers of tea, grown mainly in highland regions, are Kenya, Tanzania, MALAWI, ZIMBABWE, and MOZAMBIQUE. Major coffee producers include Ethiopia, UGANDA, Kenya, Tanzania, and MADAGASCAR. Cocoa, best suited to tropical regions, is cultivated in West Africa. Grapes, produced in northern Africa and South Africa, are used primarily for making wine. These are all important cash crops, grown mainly for export. Other cash crops include palm oil, coconuts, cashews, rubber, tobacco, cotton, and sugarcane. African farmers often struggle to make a living off the land. In many countries, between 70 and 90 percent of the people engage in farming on very small parcels of land, growing just enough to meet their own needs. Although the environment largely determines which crops are grown, local cultural, social, and economic conditions shape methods of cultivation. Traditionally, Africans in savanna regions and in tropical forest areas have practiced a method of farming known as shifting cultivation. Farmers clear trees and shrubs from a small patch of land, burn the vegetation to enrich the soil with nutrients, and then plant crops. After two or three years of use, the soil becomes exhausted and the patch of land is left fallow for anywhere from 4 to 20 years until natural processes restore the fertility of the soil. Meanwhile, farmers move on to clear and plant another parcel of land, and in this way prevent soil erosion. Shifting cultivation requires large amounts of land. In recent decades, African populations have grown dramatically and expanded onto much of the available land. As a result, this system of cultivation has begun to disappear in many parts of Africa. The increasing scarcity of land has led a lot of farmers to adopt a system of rotational cultivation. This means that they plant different crops in the same fields, leaving some areas fallow for short periods. Much rotational cultivation relies on the use of fertilizers and other agricultural techniques to maintain the fertility of the soil. In most of North Africa, and many areas south of the Sahara, farmers continuously plant crops in the same fields. This system of permanent cultivation is used where population densities are very high, farmland is very scarce—as in North Africa—or where the soils are naturally very rich—as with the volcanic soils of east Africa. To maintain crop yields and fertility, farmers use modern techniques such as commercial fertilizers, special seed varieties, and irrigation. In many regions south of the Sahara, these different systems of cultivation overlap. For example, rotational cultivation is often combined with the permanent cultivation of household gardens. Permanent cultivation of cash crops occurs alongside subsistence crops grown under shifting cultivation. The majority of farmers in Africa have very little money to invest in modern technology. As a result, most agriculture is very labor intensive, with individuals performing the work on their small plots of land using hoes, hand plows, and other simple tools. Mechanized farm machinery such as tractors and harvesting machines generally are found only on large commercial farms that produce cash crops for export. The price of oil has become far too high for ordinary farmers to use these machines. In some areas of Africa, especially densely populated regions, farming is often closely connected with livestock grazing. Some farmers use cattle as draft animals to pull plows and spread animal wastes on fields as fertilizer. In other areas—including parts of Nigeria and Kenya—nomadic herdsmen usually live apart from settled farmers, resulting in a lack of access to draft animals and natural fertilizers. Irrigation and terracing are two agricultural technologies used in Africa. Irrigation is especially important in the desert regions of North Africa, enabling farmers to cultivate land that would normally be unsuitable for agriculture. In some hilly regions—such as in northern Nigeria, CAMEROON, SUDAN, and Ethiopia—farmers have built terraces on hillsides to create fields and protect the soil from erosion. The division of labor in African agriculture is flexible and diverse. The ways in which different societies organize farm work vary so much from region to region that it is difficult to make generalizations. As a rule though, particularly in subsistence and peasant farming communities, men prepare the land and women plant and harvest the crops and perform most other agricultural tasks. Besides growing food for the family, women also plant vegetables to take to the market, prepare cooked food to sell on the streets of towns and cities, and work as day laborers. Throughout Africa, land traditionally was distributed and assigned according to age-old political and social customs. In some places, decisions about land were made by village chiefs; in others, by democratic village institutions, religious leaders, or elders. Much of the land was owned in common by all the people of a particular village, region, or group. During the second half of the 1900s, many governments in Africa began to introduce land reforms aimed at changing the traditional land and labor systems. The goal was to create landholdings owned and operated by individuals rather than by groups. It was hoped that such reforms would increase farm production and create more stable agricultural economies. Along with land reform, African governments also encouraged farmers to grow cash crops that could create export income for their countries. Such policies have contributed to serious problems in African agriculture. Land reform led to confusion and conflicts, as different ethnic and social groups struggled over ownership of land. In some areas, the reforms left some farmers without any land. In others, government attempts to force people to settle elsewhere disrupted traditional societies. This occurred in Tanzania under President Nyerere when farmers were forced to live in large communal settlements based on the Chinese model. The increased emphasis on cash crops has contributed to shortages of basic food crops, making it difficult for African countries to feed their populations. As a result, many countries now import food. Rapid population growth has added to the problem, creating a demand for larger quantities of food. 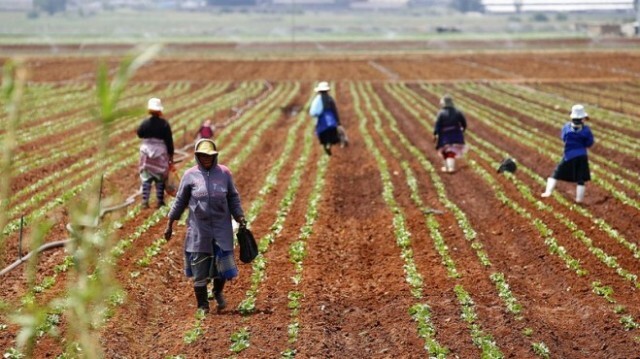 At the same time, the migration of Africans from rural areas to cities has reduced the number of people engaged in subsistence farming who grow enough to feed themselves. Environmental conditions and crop failures have added to the problems of agricultural production. Africa has always experienced periods of drought and famine. However, as populations have risen, it has become increasingly difficult for African nations to cope with crop shortages. This situation has been made worse by the lack of cheap long-distance transportation.